If you’re looking for a simple SMS filtering iOS app that sends incoming SMS into the junk folder, VeroSMS should be your first pick. While it does filter messages on its own, you are the guiding light for the same because you have to define each keyword that VeroSMS should block from showing in the main messages tab. You can define a blacklist/whitelist using keywords and sender names (such as AT-AIRTEL) you want the app to filter or not, respectively. You also don’t need to worry about VeroSMS toying with the content or details of the SMS because all spam processing happens locally on the device. Neither the contact details nor the private messages are sent to an online server for processing. But if you’re already feeling overwhelmed with the manual updation of the blacklist/whitelist with new keywords, you can download a crowdsourced keyword list for your location right away. 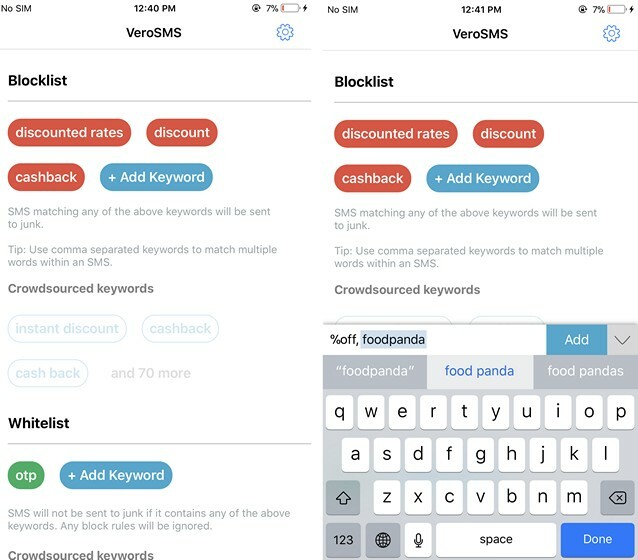 You just need to complete a $0.99 in-app purchase to filter messages based on the keywords in this crowdsourced list. Entering each and every unfavourable keyword to filter messages could be tiresome. 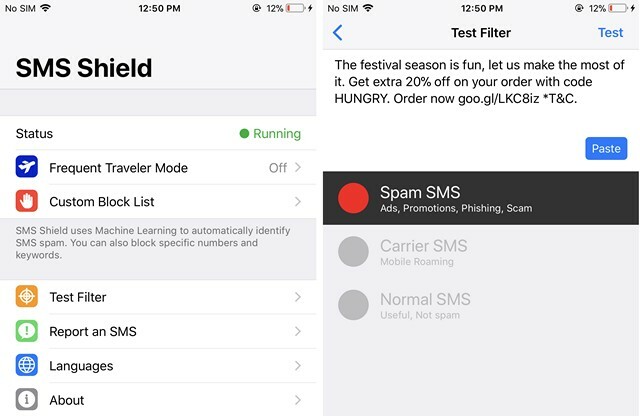 So, it will be much easier for you to use SMS Shield as it can automatically detect spam SMS such as promotions, ads, phishing, and scam attempts using machine learning algorithms. However, you still have the option to add more keywords you feel shouldn’t appear in your message inbox. All SMS processing is done offline, locally on the device. In our tests, SMS Shield was able to filter out most spam without any interference from us. My favorite feature of the app will surely have to be the Frequent Traveler Mode, which was able to save me from the constant roaming message spam from my carrier. I travel to Delhi from Noida for work, resulting in a ‘Welcome to New Delhi..’ message each day. I no longer have to worry about such messages, thanks to SMS Shield. SMS Shield is one of the best SMS spam filtering apps of the lot but requires you to shell out $3.99 for a yearly subscription. There is no free tier but you are given a seven-day free trial period to test the blocking capabilities of the app. You can choose to continue the current subscription or shift to another app, post the trial periods end. SMS Checker is yet another machine learning-enabled SMS filtering app that is available for free if you’re again willing to add keywords manually. But, it also includes Smart Filters to automatically separate out junk messages. This smart filter is not restricted to only English conversations, but can also filter Turkish spam texts with ease. However, you’re required to make a one-time payment to activate automatic blocking. The developers are currently training the app to understand and filter messages in more languages in the near future. Till then, you can define customizable rules, a blacklist and whitelist, to include keywords or sender’s name and not receive notifications of the same. 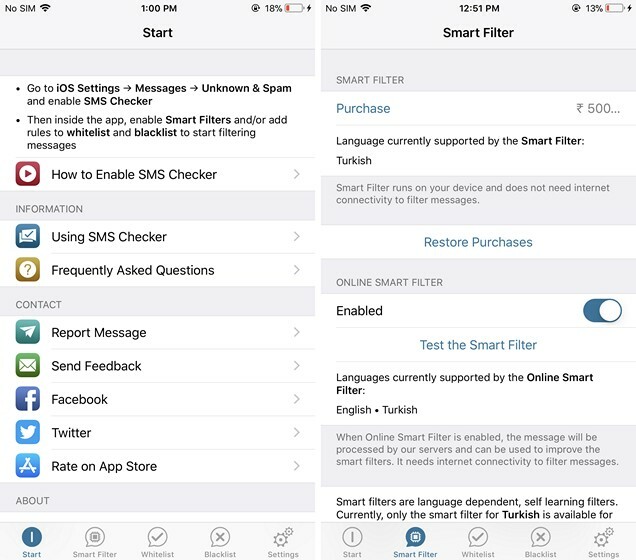 The Smart Filters currently operate online, sending SMS data to unknown servers, but the English filter is expected to be made available offline in an upcoming update. This means that all processing will then occur offline on the device, helping you maintain your privacy. 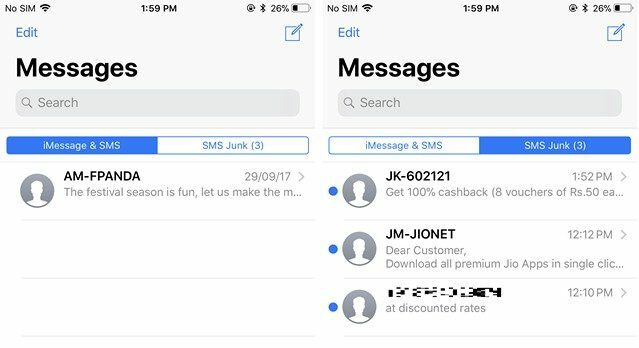 If you can shell out the decently high one-time payment, SMS Checker is also one of the better SMS spam detection apps. In addition to these three apps, we also tried out a handful of other SMS blocking apps but none of them were up to the mark. They let some spam messages slip through the cracks and that’s exactly what we don’t want. You can also try out Truecaller to get access to both phone and message filtering but the latter is still finicky. Also, it is important for you to understand that SMS filtering will stop working for a contact if you reply to them at least three times. This is because iOS 11 now assumes that you are conversing with a known contact and it no longer requires to club their texts under the junk tab. Firstly, navigate to Settings > Messages to enable the feature by selecting the third-party SMS blocker app of your choice. Note: Here, you’ll see two different options, namely iMessage Filtering and SMS Filtering. While the former activates native filtering of unsaved contacts from your message inbox, the latter displays the complete list of third-party SMS blocking apps you have installed. If you tap on any of these apps, such as VeroSMS, you’ll see a pop-up window with a privacy-related warning message. 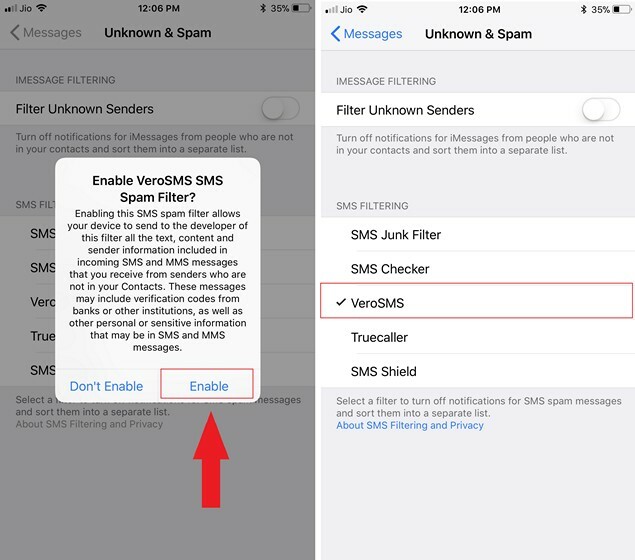 Tap “Enable” to activate spam SMS filtering on your iPhone, running iOS 11. Going back to the Messages app, you’ll now notice that a new “SMS Junk” tab has been added to your message inbox on iOS 11. All unsolicited texts will now appear under this tab. Is It Safe to Trust Third-Party Apps With Private Data? The primary concern of anyone sharing their personal messages with a third-party app will have to their privacy. 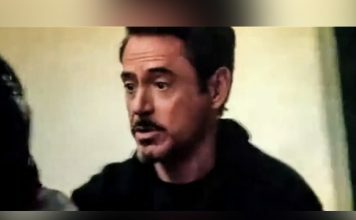 The text messages not only contain contact details of the sender but may also include private passwords, addresses, links or more. Apple has taken everything into consideration before handing out access to their SMS API to third-party developers. It has designed certain safeguards to prevent misuse of your private data. Firstly, the company is warning the users that their SMS may be transferred from the device to process the contents for accurate filtering. It shows a warning pop-up window, as seen above, that you need to accept to enable the SMS blocking process. This means you are granting third-party apps access to your messages, either to process them online or offline. Apple is acting in good faith and putting all their trust in developers, allowing them to send private data to online servers for processing. However, it has instructed them to delete the messages after receiving or encrypt them if they’re put on hold. This may allow developers to accumulate large amounts of data, which if not protected carefully may be breached by attackers. To counteract the same beforehand, the developers can download databases and assign all rules to operate offline. It means your messages, including the sender’s contact details, will no longer leave the iPhone. All SMS filtering will happen locally, allowing developers to fully utilize the powerful new chips, running iOS 11, for machine learning-powered processing. It means your private messages are safe and you can use these third-party apps to clean up your inbox. 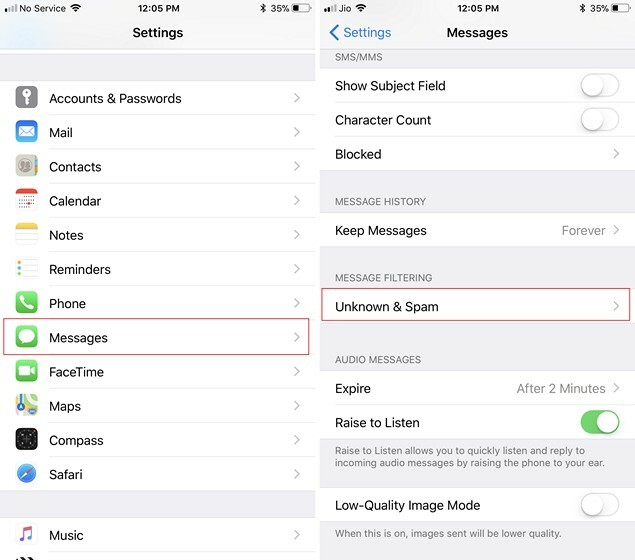 We’re grateful to Apple for finally blessing iPhone users with the SMS filtering feature in iOS 11 because we know how difficult it gets to sift through the combined clutter of iMessages and message spam. If you are not too uptight with privacy then any of the aforementioned solutions will come in handy in eliminating spam from your message inbox. If there is an SMS blocking app that you think should’ve gained a mention, comment down below and let us know.